Thanks nuvofelt! That was fast. I JUST posted and here you are! I had a fantastic trip, and I’m planning on returning to the windy city in spring when my youngest daughter has her baby. 🙂 I’m sure I’ll get more photos then, too. My kind of town– which a few weeks ago we left for life in a small mountain town. When Maggie Daley died a month or so ago, the city learned what a contribution she made to the city’s beauty. Not the architecture, of course, but the little details, like flowers, that women think about. I remember coming to visit you on my birthday years ago ~~ my first trip to the windy city. Now that both the girls live there, I make it back more often. I’m glad that Ms. Daley thought of the flowers! Beautiful city. Thanks for stopping by, Nancy. Beautiful photos! It makes me want to visit Chicago. I haven’t been there in years, but always enjoyed it. Glad you like them Louise. I was there in Nov., and I will be heading back in March for the birth of my youngest daughter’s baby. 🙂 Thanks for stopping by. Wow, these are perfect! I think the second is my favorite, but I’m not sure why. Thank you, Kathy. I LOVE the second one, and the bridge high up that connects the two buildings. Yes, SL was one classy lady, and quite beautiful (and as far as I know, she still is.) M, on the other hand, was an object, an icon, a confused soul in search of love and meaning, and she, too, was beautiful. Hers was a sad story while SL’s was a story of success. Quite a contrast! But M will forever be associated with the Chicago and the Chicago Tribune building (did you notice that in the background?). What a sad story. Cecelia, you certainly have some excellent “between” photos. You are also a wonderful photographer. Thanks Barbara. Photography is my psychotherapy!!! 😉 Glad you like the photos. Good shots . 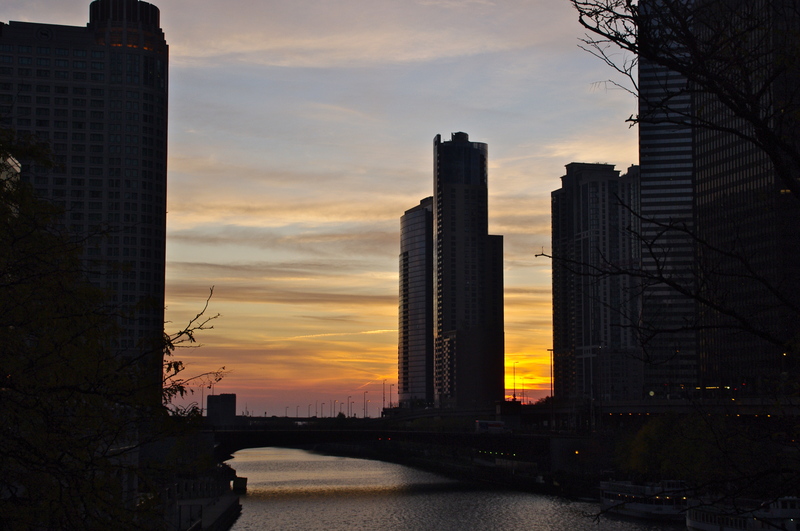 . . especially the elevated bridge between buildings and the sunset . 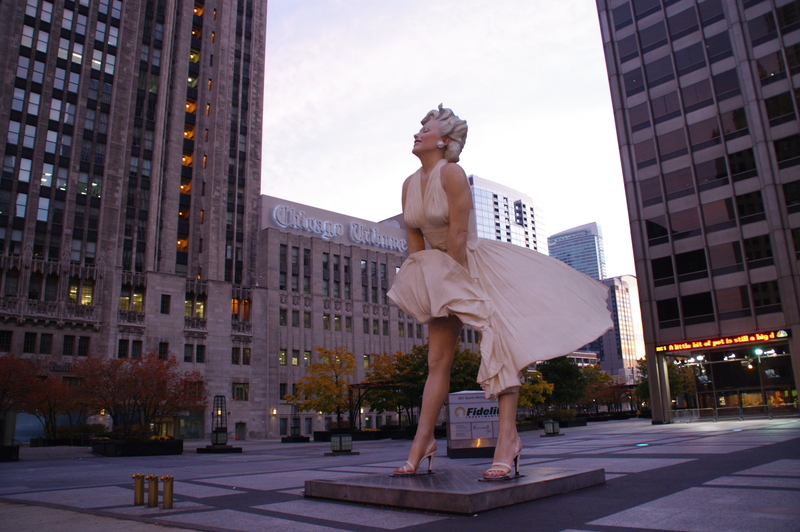 . . although Marilyn looks pretty spectacular too. Glad you like the photos. 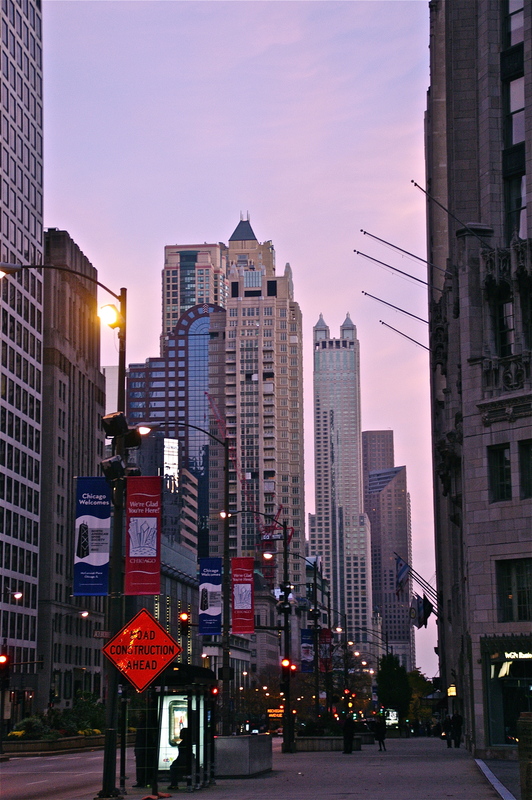 I had fun that morning (sunrise in the windy city on a sunday morning when we practically had the streets to ourselves!) Thanks for dropping by, Nancy. what a great mood on your last image, but all of them are great interpretations for this challenge. looks like you had a wonderful time. thank you for sharing! Sunrise on a Sunday morning in the windy city! The streets were empty, the sky was reds and pinks and yellows. My daughter’s boyfriend picked me up at Union Station and we went sight seeing and photo shooting before going out to the house. It was Awesome! Yes, it is a beautiful city. My daughters live there so I hope to make it many more times! The colors that morning were awesome! Sunrise in Chicago!! Gave everything a wonderful golden-rosy-sunrisy color. I’m glad you like it. Wonderful shots for this challenge. Thanks! I’m glad you like them. I had a great time while I was there. Chicago is just stunning and beautiful.Between the images that you see and the photos you captures, lies the ability to inspire, to marvel and awe people…including me. Thanks. Wishing you and your family all the happy blessings for the New Year! Thank you for stopping by, IT. You are very kind in your comments. I’m glad you feel inspired by the photos. AND I am wishing all of you a very blessed and inspired New Year! 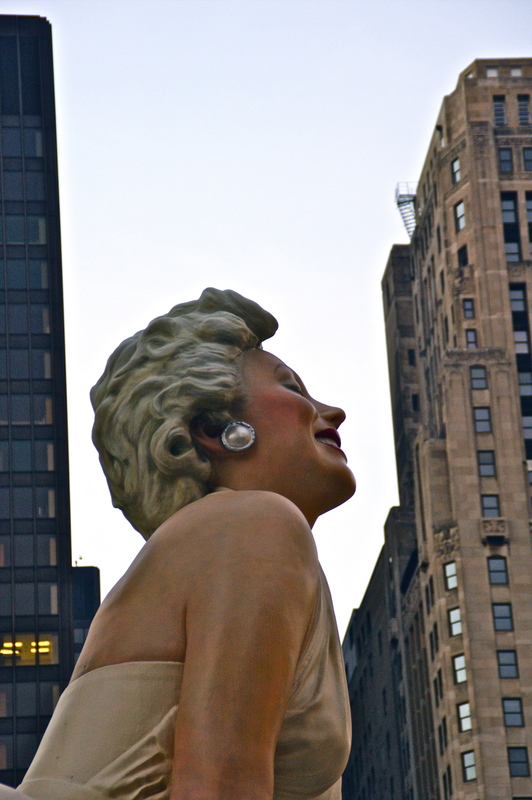 I love Marilyn between framed between the high rises! All are beautiful photos! I love how you really ‘see’ things that a lot of people just glance at. Great entry Cecelia! Thanks Theresa, I am happy that you like the photos. Chicago is a fun place and I will be returning in March for a few weeks (my “baby” is having a baby!). Thanks Robin. I was there in Nov. Will be heading back in March. Glad you like the shots. I was surprised by photo no. 2, the bridge between the skyscrapers! Cool, huh! I loved that building at first sight, and the skywalk is wonderful. 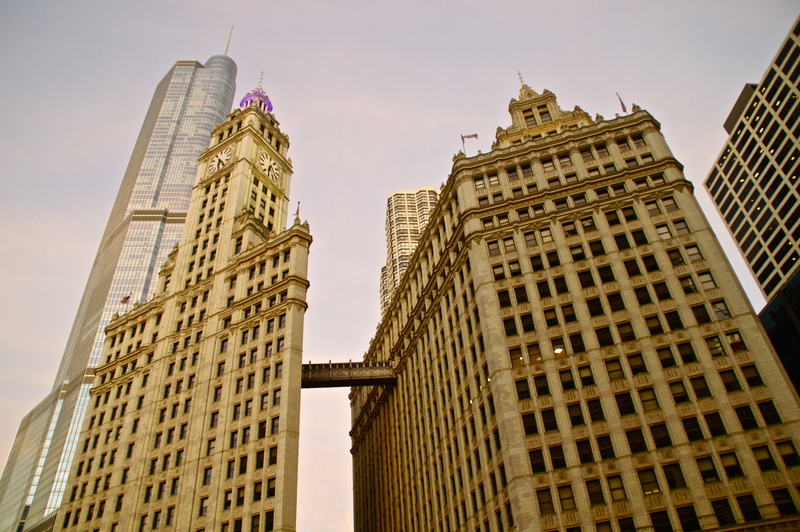 Next time I’m in Chicago I hope that I can walk across that skywalk. Bet the photo ops from that perspective are fantastic. Thank you Elizabeth. The day I took those photos was magical. I arrived in Chicago at sunrise on a Sunday morning. My daughter’s boyfriend picked me up and drove me around the city for some photo ops before heading out to their house. Truly special. Glad you like the photos.